Drivers struggle with parking lot chaos. When the school day is over, it may be time to brace yourself. The LHS parking lot can be challenging to get through when drivers are all trying to leave. 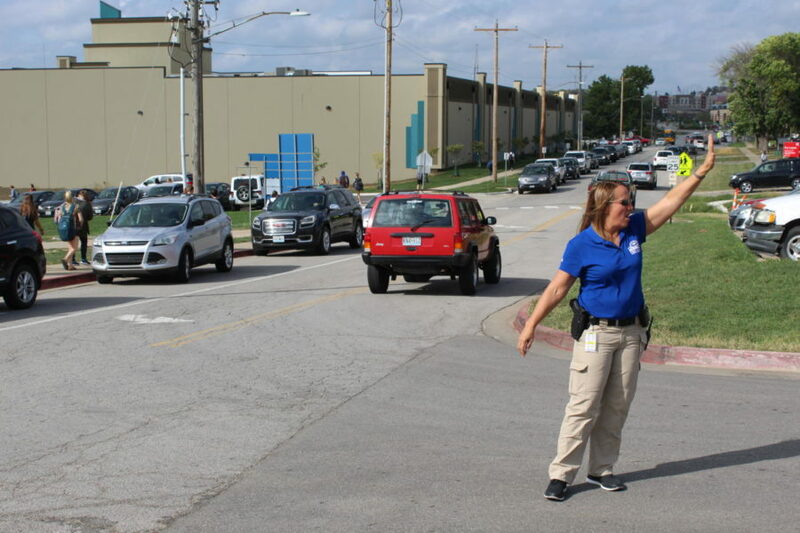 Security Officer Kim True, who helps direct traffic in the afternoon, has seen near misses in the parking lot. There is frustration in the parking lot from the students, but are they the only ones to blame? True thinks the problem in the LHS parking lot is not just the student’s fault. One of the main issues that was expressed by students in a poll conducted by The Bell is that parents picking up their children from school simply do not know where they are supposed to be and how the parking lot works in general. Parent drivers are seen weaving their way through the outgoing lines of student parking lot traffic. Another concern about driving in the parking lot is cellphones. Students, as well as adults, have been taught for years that cellphones are one of the leading reasons why people get into car accidents. Though we have heard this repeatedly, people are still seen texting, calling and picking music while they are leaving the parking lot. “In general, I think we all need to put the phones down and slow down,” science teacher Richard Fairchild said. Students can get their parking pass taken away if they violate parking lot rules three times or if the administration calls for it immediately. Already, about five students this school year have had their parking passes taken away. The speed limit of the parking lot is ten mph, however there are currently no signs displaying this information. There are two signs on BlueJay Drive saying 25 mph. Another issue that students and teachers have expressed their concern about is the lack of available parking. Assistant Principal and Athletic Director Jason Cahill, who manages the parking lot, has figured out exactly how many parking spaces there are. Students think there are things that can be changed in the parking lot including parking spaces and the parent line, but it first starts with themselves. For unsafe habits, report the driver to the school administration for the safety of others.